Rosetta and Comet 67P. Copyright Spacecraft: ESA/ATG medialab; Comet image: ESA/Rosetta/Navcam. 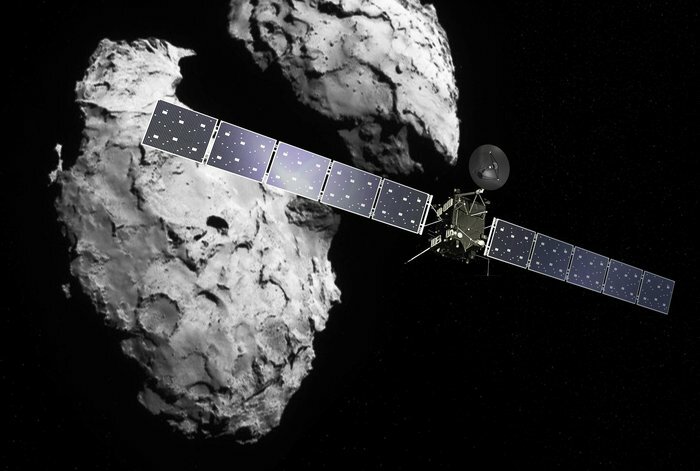 Artist’s impression of ESA’s Rosetta approaching comet 67P/Churyumov–Gerasimenko. This entry was posted in Poetry, Verse and tagged Comet, Life, Philae, Philae Lander, Rosetta, Rosetta Spacecraft, Singing, Space. Bookmark the permalink. Funny. I did a poem for Philae too! I turned it into a story instead so haven’t posted it. I think it is an event for poetry. I was thinking about it but when I read an article about the comet “singing” I KNEW I had to write something. I imagine it roaring more than singing, but maybe it’s a nice kind of comet. I don’t recognise the tune but it could get really big!